A 47 years old woman had both hands amputated 28 years ago. 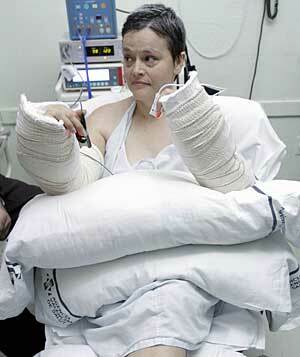 Now she is the first patient in Spain to receive a transplant of both forearms and hands. This operation was done in La Fe Hospital in Valencia, Spain by the team of hand surgery of the Pedro Cavadas’ Foundation. This is the 7th similar surgical procedure in the world and the first performed in a woman. The patient will recover part of her sensibility in a period between five and six months. She will be healt in future I think. This is amazing. I would love to be able to follow her progress……..